Not much to update this week. Almost all of my changes were to the underlying code – optimizing it for readability and maintainability – hopefully these changes will make it easier to develop some of the remaining features in the game. I’m also going to try to update more often this week, rather than making you guys wait until next Saturday. 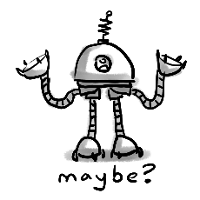 Maybe I’ll make some promotional artwork? 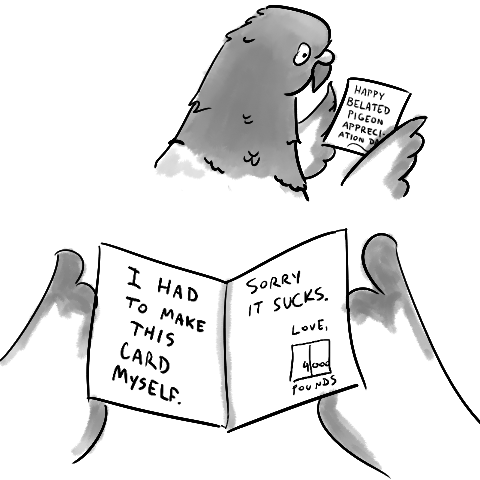 I mean, I didn’t even know that Pigeon Appreciation Day was a thing. Boy did I miss that boat – I didn’t even know there was a boat to be missed! But so what, right? Why does it matter? 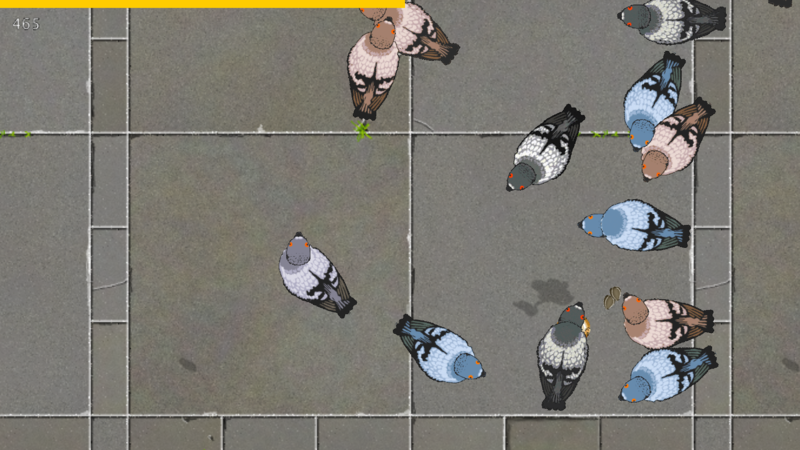 Well, considering that 4000 Pounds is currently developing a game that features pigeons as main characters – our first game, which needs all the exposure it can get for this career path to ever be successful – doing nothing to recognize Pigeon Appreciation Day was probably a mistake. Full disclosure: I am new to the concepts of marketing, which is probably why I’m completely failing at it. Uhh… that is, what I’m trying to say is… It’s important for me to recognize my mistakes. That way I can get better. And maybe I can help others to avoid the same mistakes, right? But I guess that’s my point. I should be seizing every opportunity I can to get people to notice my work. To me, that’s what self promotion really is – not telling people to check you out, but just making a bunch of noise. Am I wrong? Should I be putting more artwork on this site, and blasting it with more information than just my weekly updates? 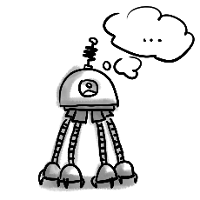 Like, tips and howtos for things I’m working on, or just more information about my game and the process of coding it / creating assets for it / promoting it / wishing more people were interested in it? Does any of that sound even remotely interesting to anyone? I mean besides the crickets..? 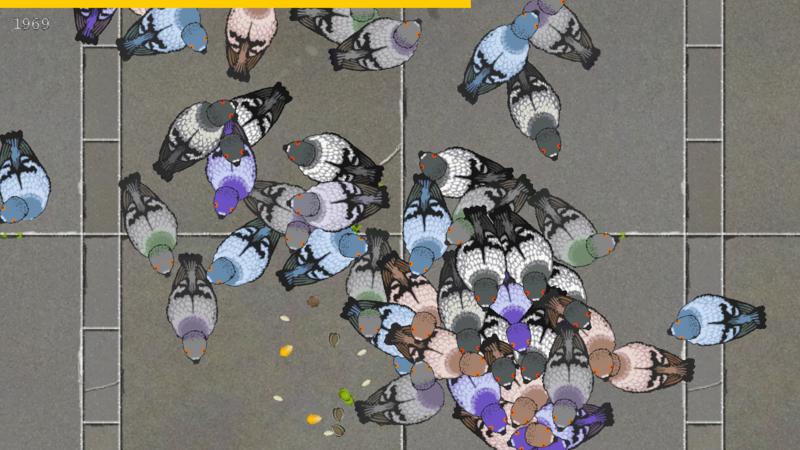 So there are commemorative days for almost anything you can think of, and they provide an opportunity to be noisy and get attention from people who may easily be a part of your target audience (or probably should be – for example, a lot of people who are interested in my game aren’t interested in pigeons specifically, but a lot of people who are interested in pigeons might very well be interested in my game). Create some special concept art to attract people who love the subject but aren’t aware of your game. Prepare a unique sample of in-game footage, maybe even create special game footage that specifically recognizes the day. Of course, you have to know that the event is approaching. My excuse? I’m a developer (lame excuse, I know). My head is always down and in my work, and my main focus, above all else, is the gameplay, which is far more important to me than the subjects that are acting it out. And yet, that really shouldn’t excuse me from knowing my subject better. The subject of my game is what people see, it’s the only way people who have not played the game can identify it. My subject is pigeons, and so I should read more about pigeons and know more about pigeons. If pigeons get a special day, I should know about it beforehand. I should have paid more attention to my subject. I should have shown more appreciation for it. For them. 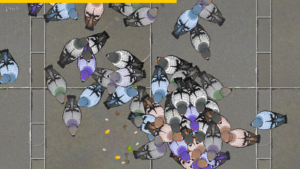 I’m sorry, pigeons. I have only myself to blame. That said, even late recognition is better than none at all. So I want to wish you all a Happy Belated Pigeon Appreciation Day! Still no sound/music. I have been thinking about bonus waves, but need to figure some things out first (such as how I want the player to unlock them). Check out these sick moves. Here are some full-screen screenshots, so you can use them as your desktop background and pretend you are playing the game already. It’s like Where’s Waldo. With pigeons. Next week – still pursuing sound/music, but probably I’ll spend most of my time working on finishing the rendering logic changes and focusing more on marketing strategy (fun). I added scoring to the game. I still need to figure out how the player should get points – right now it is just by eating food, so scores don’t get very big. Also I added a placeholder background image. Looks a lot better than the plain gray background. 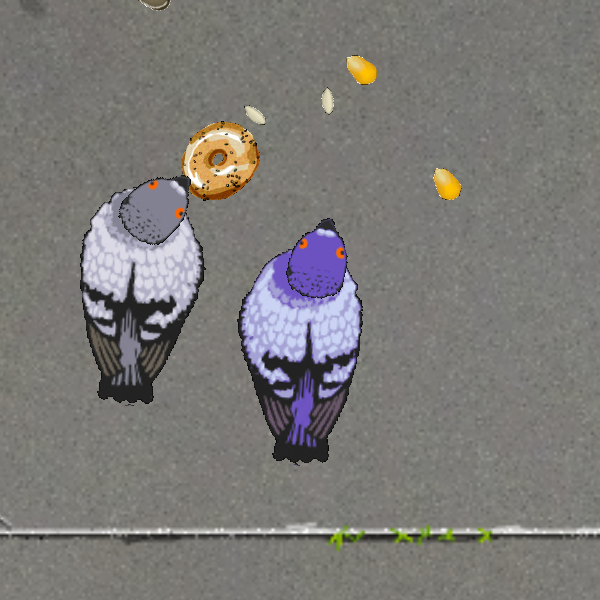 ALSO I added a “Game Over” screen that shows when the player’s pigeon dies, plus a single-frame death sprite for the player. I didn’t get sound effects added, so that’ll be on the task-list for next week, along with bonus foods and special waves. I also want to do some more work on the rendering code, so I may be able to add lighting effects later.